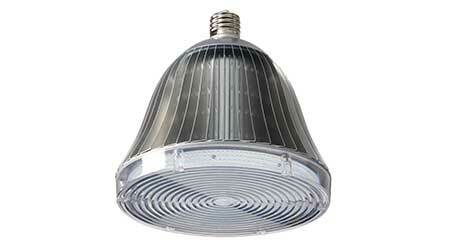 LED Dimmable/IP64 High Bay lamps for HID retrofit are dimmable three ways: 0-10V DC, pulse width modulation, or resistive. They also use an external driver, which can be mounted up to 250 feet away. Model LED-8034M is 150W replacing up to 400W HID. It produces 19,344 lumens at 5000K. Model LED-8050M is 300W, replacing up to 1000W HID. It produces 34,153 lumens at 5000K.